I seem to remember being vaccinated for measles as a child, and I definitely remember having both my children vaccinated for the highly infectious respiratory virus. I guess I figured everyone did the same—that it was mandatory, even. That’s why I was surprised when I heard the words ‘outbreak’ and ‘measles’ in the same sentence – astonished that even though practically everything for kids requires immunization records, there was enough “un-immune” children in one theme park to create a legitimate measles outbreak. The measles vaccination was considered a huge medical breakthrough saving hundreds of lives every year in 1963 – being as measles was (and still is) considered the most infectious virus on Earth. Measles cases and outbreaks by year 2001 to 2015. 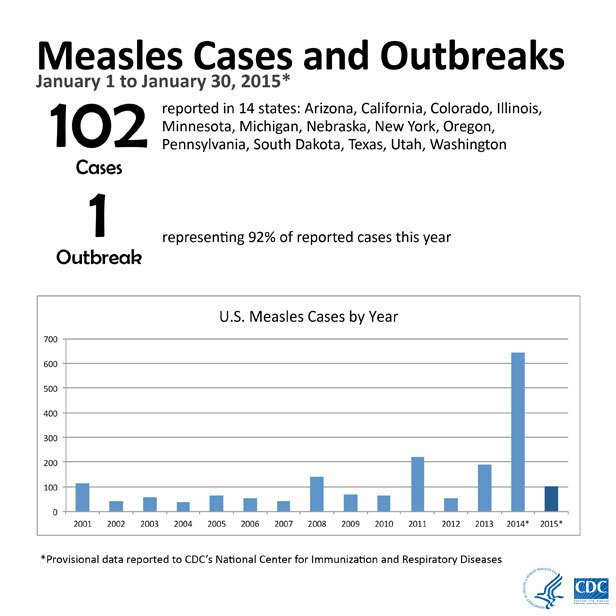 January 1 to January 30, 2015 as reported by the CDC. Don’t worry about saliva or physical contact, the measles can be passed simply by means of breathing. Actually, you can catch measles just by being in a room where a person with measles has been, even 2 hours after they leave! In the decade before the vaccine became publicly available in 1963, practically every child contracted measles by the time they reached 15 years – thousands of young children died. At lease 400 people died per year. A skin rash made up of large, flat blotches. I am certainly skeptical of any liquids being injected into my children, but I cautiously research cases of both non-vaccinated and vaccinated children of the same age range as my own. I weigh the pros and cons of having the vaccination verses having the illness, and then make my choice (The vaccination is commonly referred to using the acronym MMR, which stands for measles, mumps, and rubella). First, the MMR vaccine is far less risky than getting the measles, mumps, or rubella. You won’t have to worry about catching the measles, mumps, or rubella. The MMR vaccine does not cause Autism – In 1998, a British association investigated 12 autistic children claiming that the MMR vaccine caused the disease to manifest. However, this association has since been disproved, and the claim declared untrue. As for adverse events following the vaccine, an estimated one in six people will experience mild fever following vaccination. One in 20 will experience a mild reaction, such as a rash, related to the shot. The rarest of the adverse reactions is the experience of swelling, with one person out of 75 expected to experience this adverse effect. In January 2015 alone, the CDC reported 102 people to have measles, from 14 states; and as director of research for Lux Property Group, I’ll speak for all of us in Arizona and say that we are not surprised to be one of them. The one and only protection from measles is the MMR vaccine. It’s also the only way to protect your kids from the pain and missed school that goes along with it. There you have it. I guess all that’s left to do now is sit back and let the measles outbreak run its course.